Just Romantic Suspense: Summertime, beach reads, romantic suspense…and a little Google fun! Summertime, beach reads, romantic suspense…and a little Google fun! Is it as hot where you as it is here in Florida? Not only is it hot, but we’re nearing peak hurricane season in the Sunshine State. Time to angst about so many things. If it looks like a hurricane is headed our way, it’s whether to put up the plywood or shutters or not (and when). Do we have food, water and meds for at least three days? And more importantly, whether or not to evacuate based on location. But if you’re going to a beach, whether in Florida or at a lake or river, beach reads are a must. Sometimes these are defined as books literally set on a beach, or books you take to the beach, though sometimes there are more elaborate descriptions. More on that at the end of this. 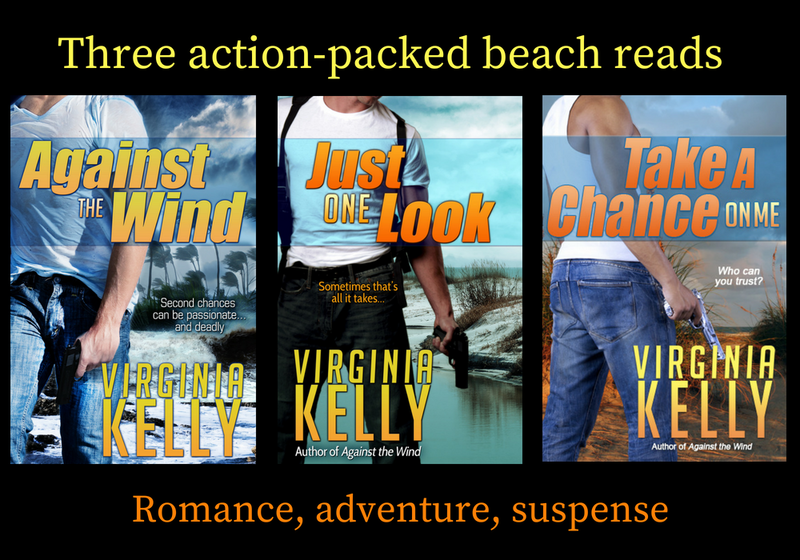 Since this a romantic suspense blog, I’m going to define beach reads as romantic suspense books set on a beach. I’ve written three such novels. After, all what’s the point of living in Florida if I can’t take advantage of the setting? Better yet, since we’re nearing the end of what the rest of the country calls summer (ours just keeps on giving), all three books are on sale through September 1, 2018. My Florida Sands Romantic Suspense series is about three of the Alvarez siblings. These are stand-alone reads, with limited overlapping characters. Each has it’s own conclusion. No cliffhangers. I promise! In Against the Wind, FBI Special Agent Michael Alvarez, wounded and on the run after being falsely accused of murder, has chosen to hide on the northern Gulf Coast of Florida. But there’s a Category 3 hurricane lashing the coast and he’s forced to seek shelter with the woman who refused his marriage proposal years ago. Potentially more dangerous is the fact that her brother, also a Special Agent, is hot on Michael’s trail and isn’t about to give up. Will his trust in the woman who once loved him turn out badly for them both? Just One Look is about Mia Alvarez. At her brother’s wedding, FBI Special Agent Drew Davenport catches on quickly that she’s being stalked and sticks close. He’s fallen hard for her but Mia’s not ready to trust a man she’s just met. When her stalker comes directly for her, Mia has to trust Drew with her safety—but what about her heart? I hope you’ll see the humorous first hit Google presented me. (Hint, if it isn’t obvious, the definition comes from a site called eclectrictliterature. Read Sarah Gerard’s definition). What do you think at that definition? What do you classify as a beach read? I’d love to read your comments. Interesting blog. Florida in the summertime doesn't sound like fun, but the beach reads do! I love beach readsand will definitely look for your books. Thanks for commenting, Linda, and for checking out the books. I didn't find Sarah Gerard's definition, but for me a beach read is not heavy literature, but definitely engaging enough that I can't put it down even at the beach. Now I'm off to click the links to your books! Oh no! Sorry you didn’t find the funny definition. The next comment quotes from the definition. Thanks for commenting and checking out the books. This is the definition that popped up for me: "A beach read is a book that is made of the beach. The covers of beach reads are sand packed into wet towels left to bake in the sun. The pages are made of dried seaweed — so when the blurbers say they've “devoured” the book, that is to be taken literally.Jul 14, 2017"
You found it! 😄 Thanks for quoting. Those definitions are funny. But! This is a great series. Highly recommend. Thanks, Jonetta. So glad you enjoyed the books—and the definition. I second Jonetta. These are fabulous books. Although I have to say, as a Wisconsinite, Florida beach reads like these are just as good in the winter as in the summer. Thanks, Ann. I don’t think I’ll ever get in the water in the summer in Wisconsin. Brrr! I wait until our Gulf waters are over 80F before I swim. To me a beach read is something that take a place on the coast. On a beach or lake. Summer time swimming. I can read just about anything anytime or any place.